Hi, I am interested in your 1972 Ford Bronco (stock #1214-NSH) listed on Autotrader for $34,995. I'd like to get more information about this vehicle and confirm its availability. The first-generation Broncos are very capable and popular off-road machines. 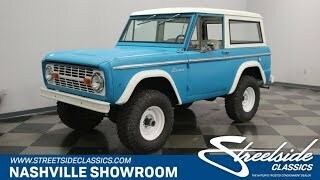 They were introduced as a competitor to the Jeep in the compact SUV market and designed with a chassis unique from the other Ford trucks which offered long wheel travel as well as a tight turning radius. This particular one packs V8 punch to boot. Check it out. The design of these trucks is simple and effective. Streamlining for aerodynamics was not on the to-do list. Neither was trying to make a fashion statement, which is funny because the form following function design became the fashion statement. This truck has been resprayed in a Medium Aqua Blue patina paint job which looks faded and worn but is really fresh and sharp looking because they purposefully added a patina look to the final product. All the glass is flat, even including the windshield, and the slab-sided narrow body was not only easy to produce but fit down narrow trails easily. White fender flares are riveted on and up front a simple white grill is underlined by a straight white bumper. A hardtop is nice for weather protection winter or summer while also providing some security for your contents, but is removable when you want to go play. At the rear, a tailgate provides access to the back and a substantial bumper with a trailer ball is ready to pull a one of your toys or a utility trailer. Open the door and you will find an interior that stays with the simplicity theme but is finished out very nicely in black, white, and blue. The door panel sets the tone with a clean white panel in the middle of a blue door. The bucket seats up front as well as the removable bench seat in the rear have been reupholstered in white with pleated seating surfaces and smooth vinyl surrounds. A black steering wheel feels good in your hands and is mounted on a three-spoke chrome hub. The dash is super simple and clean looking in white with one round gauge handling the speedometer in the center with the engine gauges arrayed around the outer edge. Two shift levers rise out of the floor, one for the 3-speed manual transmission and one for the transfer case, and the entire floor has been coated with bedliner. Open the hood and you find a tried and true, 302 cubic inch V8 motor sitting down in the engine bay. It is mostly stock but has been upgraded with an Edelbrock carburetor and intake manifold. The stock exhaust manifolds flow back in a true dual exhaust system with cherry bomb style mufflers which make this truck sound great. Signs of good regular maintenance include a recent tune up, belts and hoses that are in good condition, and a newer battery. Power flows back through that manual transmission and transfer case to solid axles both front and rear. The rear axle is mounted on new multi-leaf springs and damped by new shocks. The front also got new coil springs and shocks and the suspension bushings were refreshed as part of that process too. The rubber meets the road, or the dirt, through 285/75R 16 tires mounted on white steel wheels. An old school Bronco with a sweet looking patina paint job. Come on down and check it out.